Miriam Miranda-Jurado is the Principal at Dag Hammarskjold School No. 6, a subsidiary of the Rochester School District. Ever passionate about teaching and fostering in children a love for learning, Ms. Miranda-Jurado shines as a luminary in her field, as she has nurtured an ever-expansive skill set in educational leadership for the past four decades, and she continues to strive for excellence in her every endeavor. Ms. Miranda-Jurado feels that her ability to promote diversity, multicultural education and bilingualism among an array of social groups has allowed her to thrive as an academic leader. She has done public speaking on bi-lingual education and the state of education in Rochester. 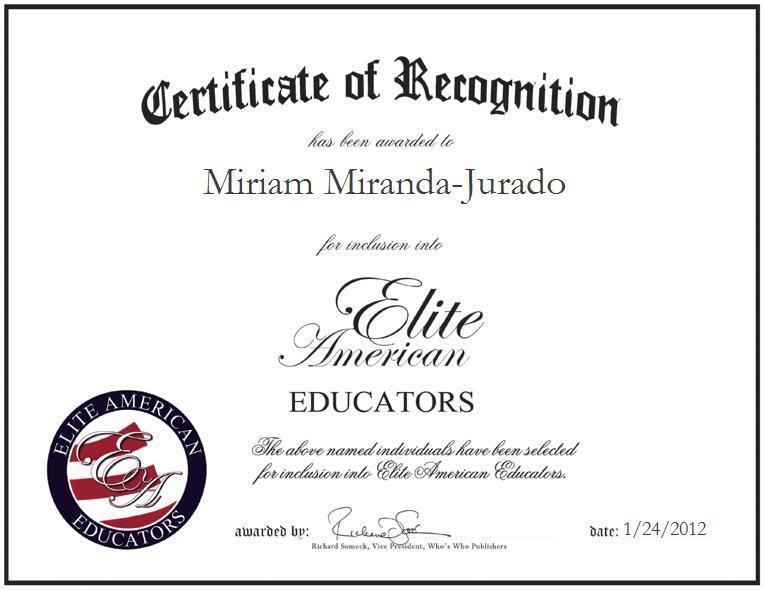 “I have made several presentations regarding bilingual education and the state of education in the Rochester City School District, and also at one of the major churches in the city,” Ms. Miranda-Jurado recently articulated in an EliteAMERICAN interview. She has a tremendous passion for people, and she has done volunteer work in Peru and Chile. In her current capacity, Ms. Miranda-Jurado teaches early childhood, bilingual and urban education to students at the Rochester school. “I have always had a passion for working with people and making things better, especially for the minority population, whether it’s for socio economic disparities or ethnic disparities,” Ms. Miranda-Jurado revealed. Her passion for working with and helping others has allowed her to herald exceptional volunteer initiatives in her community, and she was recently awarded for her efforts by Latinas Unidas. She has plans to continue to reach others and give people opportunities to learn and grow around the world. She is currently pursuing a doctoral degree, and upon completion of her degree requirements, she plans to teach on an international basis. Ms. Miranda-Jurado remains abreast of trends and developments in education as a member of the National Association of Elementary School Principals, the Association for Supervision and Curriculum Development, the Association of Supervisors and Administrators of Rochester, the Rochester Council for Elementary Leadership, and the International Reading Association.